Citation Information: J Clin Invest. 2016;126(8):2970-2988. https://doi.org/10.1172/JCI85456. Aggregation of α-synuclein contributes to the formation of Lewy bodies and neurites, the pathologic hallmarks of Parkinson disease (PD) and α-synucleinopathies. Although a number of human mutations have been identified in familial PD, the mechanisms that promote α-synuclein accumulation and toxicity are poorly understood. Here, we report that hyperactivity of the nonreceptor tyrosine kinase c-Abl critically regulates α-synuclein–induced neuropathology. In mice expressing a human α-synucleinopathy–associated mutation (hA53Tα-syn mice), deletion of the gene encoding c-Abl reduced α-synuclein aggregation, neuropathology, and neurobehavioral deficits. Conversely, overexpression of constitutively active c-Abl in hA53Tα-syn mice accelerated α-synuclein aggregation, neuropathology, and neurobehavioral deficits. Moreover, c-Abl activation led to an age-dependent increase in phosphotyrosine 39 α-synuclein. In human postmortem samples, there was an accumulation of phosphotyrosine 39 α-synuclein in brain tissues and Lewy bodies of PD patients compared with age-matched controls. Furthermore, in vitro studies show that c-Abl phosphorylation of α-synuclein at tyrosine 39 enhances α-synuclein aggregation. 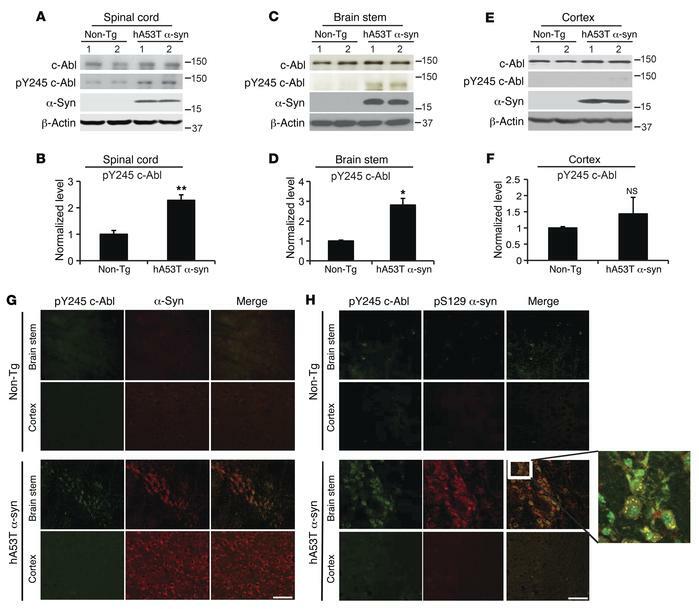 Taken together, this work establishes a critical role for c-Abl in α-synuclein–induced neurodegeneration and demonstrates that selective inhibition of c-Abl may be neuroprotective. This study further indicates that phosphotyrosine 39 α-synuclein is a potential disease indicator for PD and related α-synucleinopathies. c-Abl is overactivated in symptomatic hA53Tα-syn transgenic mice. (A, C, and E) Representative immunoblots of c-Abl, pY245 c-Abl, α-synuclein (α-syn), and β-actin in the spinal cord, brain stem, and cortex from symptomatic hA53Tα-syn transgenic mice and age-matched nontransgenic (Non-Tg) littermate controls. (B, D, and F) Quantification of pY245 c-Abl protein levels normalized to c-Abl (n = 4 per group). Data are from 3 independent experiments. Statistical significance was determined by 2-tailed unpaired Student’s t test. Quantified data are expressed as the mean ± SEM. *P < 0.05, **P < 0.01. (G) Representative immunofluorescent images of pY245 c-Abl (green) and α-syn (red) in the brain stem and cortex from symptomatic hA53Tα-syn transgenic mice and age-matched nontransgenic littermate controls (n = 3 per group). Scale bar: 50 μm. (H) Representative confocal images of pY245 c-Abl (green) and pS129 α-syn (red) in the brain stem and cortex from symptomatic hA53Tα-syn transgenic mice and age-matched nontransgenic littermate controls (n =3 per group). Enlarged image (zoom-in, ×35; original magnification, ×40) at right shows colocalization of pY245 c-Abl and pS129 α-syn. Scale bar: 50 μm.